Murchison Falls National Park is Uganda’s largest park and this makes it home to a variety of birds with over 451 bird species recorded. The bird species habituated in Murchison falls include:- the Shoebill stock, Giant and malachite kingfishers, the Goliath Heron, the largest Heron in the world, a pair of Elegant grey crowned cranes, the Blue headed coucal, Swamp flycatcher, Squacco heron, Red-throated bee-eater, African jacana, Scandpipers, Denham’s bustard, Abyssinian ground hornbill, Black-billed barbet, Black-headed gonolek, Eastern grey platain-eater, African quail-finch, Silverbird, Piapiac, Pied, White-browed sparrow weaver, Speckle-fronted weaver and many others hence making Uganda’s number one game park good for Birding safaris in Uganda. Murchison falls game drives and boat launch trips provide an opportunity for one to experience a distinct Bird life, including Savannah forest birds, water birds and albertine rift endemics. The commonest species found in the plains include the Marabu stork, Abyssinian ground hornbill, Secretary birds, Black bellied bustards, Open-billed storks and Window bird. Closer to the river here you find more thickets and woodlands, the Swallow-tailed and Red-throated bee-eaters particularly in the Nyamusika cliffs woodland, Pied, Giant and malachite kingfisher, Francolin, Hornbills, Grey heron, Hamerkop, Shrikes, Flycatchers, Cuckoos, Woodpeckers, Crombecs and Warblers, Ducks, Geese, Stilts and Plovers. Murchison falls main birding attraction is the Shoebill stock that is commonly sighted during dry season that is from January to March hence making a great 7 days Bird watching trips. 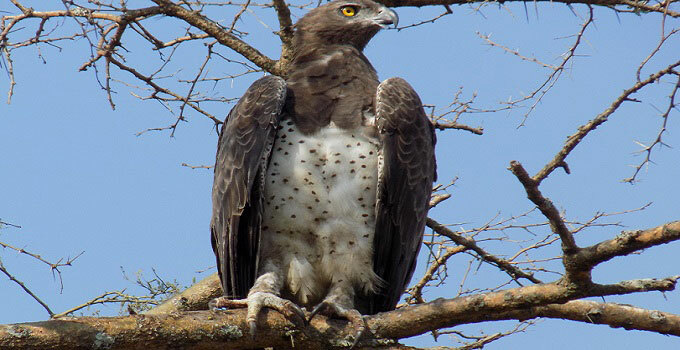 Short treks starting from Mubako junction or Sambiya river lodge that are both located on the southern bank and nature walks along the northern bank from Paraa will enable you experience the best birding sessions in Murchison Falls.